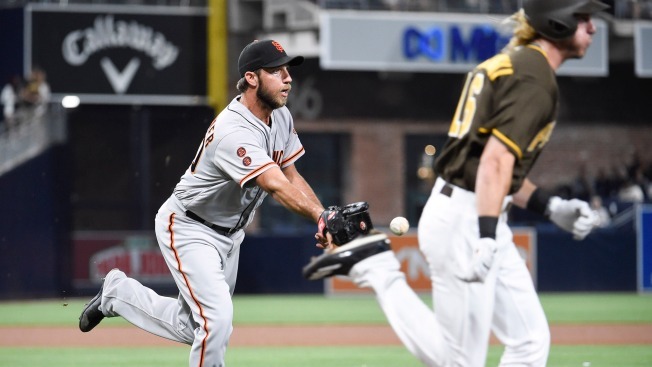 SAN DIEGO — After shrugging off a series of injuries to post baseball’s best record in the first half, the Giants hoped for even bigger things after the break. The first night back, however, wasn’t one they enjoyed. Madison Bumgarner and the lineup looked flat at Petco Park, falling 4-1 to the Padres. The Giants had won the previous nine meetings between the teams this season. Coming off perhaps the best regular season start of his career, Bumgarner had an unusually rough night. He walked Wil Myers in the first and then hung a slider to Yangervis Solarte. Myers had taken off on the pitch and scored easily when Solarte lined a double into the left field corner. The Padres scored on three straight singles in the third, one of which was a hard shot off Conor Gillaspie’s leg that appeared to be a double play off the bat. Adam Rosales ambushed Bumgarner while leading off the fourth, smashing a flat 89 mph pitch off the Western Metal Supply Co. building in left. Myers hit a solo homer to dead center an inning later and he took time to enjoy it. Bumgarner had earlier had words with Travis Jankowski and Derek Norris, and Myers posed for a second as the ball shot out to center. Bumgarner watched Myers the entire trip around the bases. On the other side, the Giants had little success against hard-throwing Andrew Cashner, who entered with a 5.40 ERA that makes no sense. The big righty gave up just four hits in six innings and struck out nine. Brandon Belt and Bruce Bochy were ejected in the ninth for arguing balls and strikes. Starting pitching report: Bumgarner was charged with four earned runs for the second time in four starts. In the two in between, he gave up zero runs. Bullpen report: Derek Law threw just 10 pitches in a 1-2-3 eighth. At the plate: Brandon Crawford doubled to lead off the second and scored on Gillaspie’s single to right. In the field: Myers hit a 107 mph liner in the seventh that looked like a sure RBI single, but Crawford, playing in on the grass with a runner on third, snagged it and calmly flipped the ball to Ramiro Pena for a double play. Return to CSNBayArea.com in November for quotes from his Gold Glove conference call. Attendance: The Padres announced a crowd of 38,522 human beings, including former Giant Jason Ellison. Up next: Jeff Samardzija makes his first start in his new rotation slot. He’ll face a gentleman named Luis Perdomo.